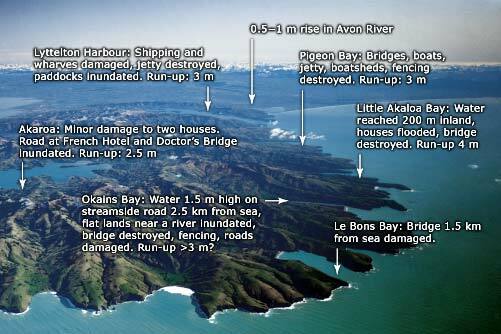 This image shows the areas around Banks Peninsula, on the South Island’s east coast, which were affected by the 1868 tsunami. The term ‘run-up’ refers to the greatest height above sea level reached by the tsunami waves. The area inundated by a tsunami wave depended on the height of the wave and the slope of the land. Download the report in the Weekly Press (22 August 1868, p. 5) on the effects of the 1868 tsunami around Lyttelton Harbour (49 KB). At the time, it was assumed that the wave was a local event. It was weeks to months later, as reports of death and damage around the Pacific Ocean were pieced together, that the extent of the tsunami became apparent.